The Wilson Inlet Catchment features a diversity of landuse and rainfall. The coastal areas receive upwards of 800 mm per year of rain. This decreases to 400 mm in the upper catchment. Viticulture, sheep and cattle grazing as well as cropping feature throughout the catchment. The Wilson Inlet is fed primarily by the Denmark and the Hay River and to a lesser extent the Little, Sleeman and Cuppup Rivers. While much of the western portion of the catchment is covered in National Park, the eastern portion in the Hay catchment is primarily cleared for agriculture. The Hay River delivers much of the nutrients and salinity loads for the Wilson Inlet and is a prime focus for WICC. Due to land clearing and land use practices the salinity levels of the Denmark River peaked at over 1400 mg/l Total Dissolved Solids (TDS) at the Mount Lindesay gauging station in 1987. Through a variety of initiatives, including regulations on land clearing and revegetation programmes the salinity levels have been reduced to around 700 mg/l TDS. 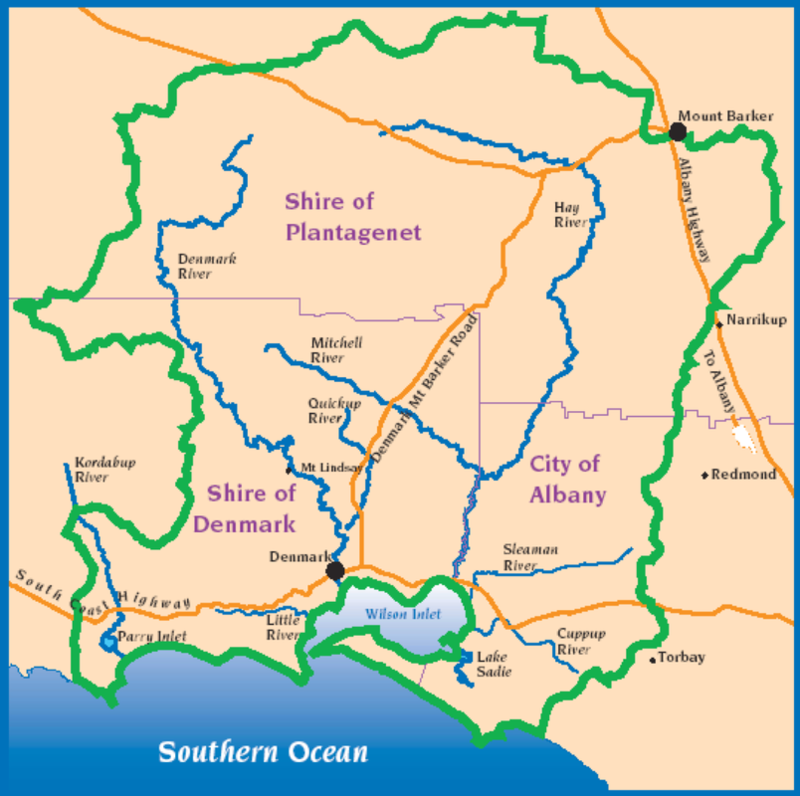 The Denmark River is well regarded as one of the few, if not only, systems in Australia that has demonstrated such a marked decline in salinity levels due to human intervention.